Mason-Dixon Council’s Off-Season COPE and Climbing Program is held at Camp Sinoquipe and runs from April 1st through June 1st when it breaks for summer camp and picks back up following the end of summer camp through November 1st. Initiative Games can take place at a location of your choosing and are a year round activity. To set up an off season event, contact the Council COPE and Climbing Chair to find a date that works for your unit and one of our instructors. Once a date is set, payment can be made at the council office. Payment must be received one week before the event is scheduled. Our staff will then meet you at camp (or at the location of your choosing for Initiative Games) for your activity. All events at Camp Sinoquipe have an eight participant minimum. We will take groups smaller than eight, but will still charge you for eight Scouts. If your unit is staying at Sinoquipe for the weekend, you will need to rent a cabin or campsite through the council office in addition to the cost of the climbing activity. Fun and exciting games centered on team building and personal growth. Challenging outdoor elements requiring problem solving and teamwork. Instruction and practice on the climbing tower and rappelling wall. Exciting and challenging high rope elements. Includes 3 hours of initiative games and 3 hours of low course elements. 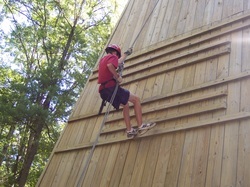 Includes 3 hours of climbing tower and 3 hours of the high rope course. The Portable Climbing Wall is available to rent for unit activities and recruiting events. The wall is free for recruiting events, but there is a $200 fee for renting the wall for non-recruiting events. To use the portable climbing wall, call the Mason-Dixon Council Office and speak with the Scout Executive to schedule a date. In order to run the wall, you must have a fully trained Portable Wall Instructor. This training is offered twice a year by the council. Once you complete the training you must assist with two events before you can take out the wall by yourself. If your unit has no one trained, we can try and find an Instructor who is available. In order to transport the wall, the council must have on file a copy of your driver’s license, a copy of your driving record (which does not need to be certified copy), and a copy of your insurance policy with coverage listed of at least $100,000/300,000/100,000. Contact the Mason-Dixon Service Center at 301-739-1211 fro more information.